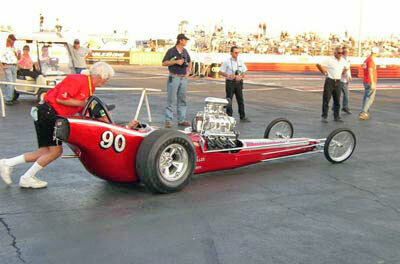 This car was originally built by Kent Fuller in early 1962 as a very light blown Chevy fueler for Vic Hubbard Speed Shop in Northern California. 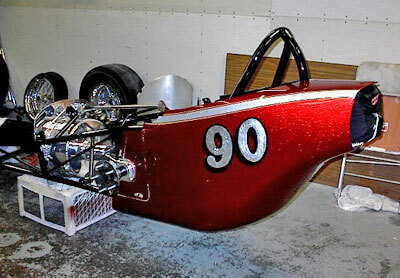 Fuller especially liked this car so the next year when Hubbard wanted a new car for the upcoming season he took this in on trade for the new chassis. 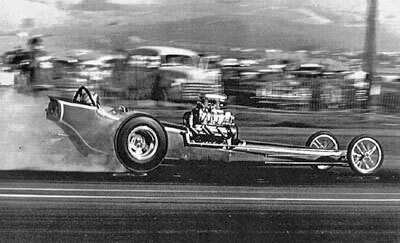 In 1963 FULLER, along with his Bonneville buddy Pervis, dropped an Ardun Flathead in the car and ran a bit over 180 with it which, as far as anyone knows, still a record for an Ardun engine. 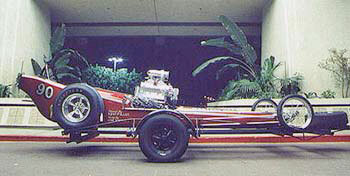 In 1965 Fuller sold the car to Jon Halstead who ran it for a year or two as a flyweight AA/GD (900 pounds), once again powered by a blown Chevy small block. 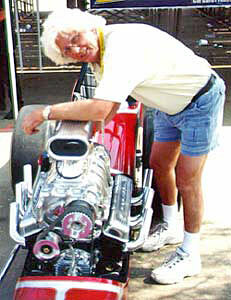 Current owner, Pete Starrett was a crew member. 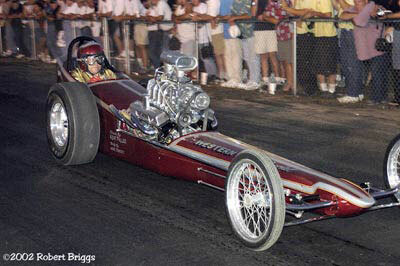 At the end of it's career the car ended up in the hands of Jim Lange who never ran it. 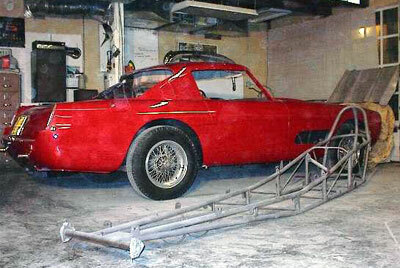 The car ended up in the rafters of his garage until 2000 when Starrett cut a deal with Lange to restore it. 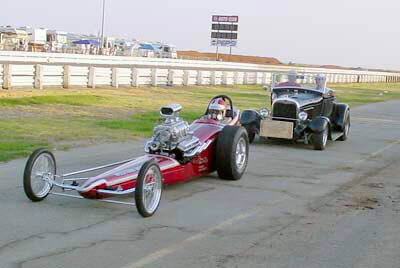 This was taken behind the starting line at Fremont the day the car first ran. 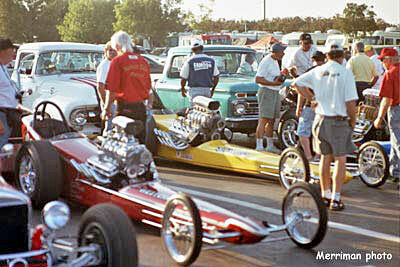 This story started when when "Jet Car" Bob Smith and Pete Starrett went to the 2000 Goodguys March Meet where they hooked up with the cars second owner, Jon Halstead. 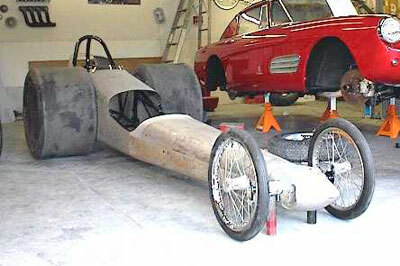 Since Starrett had just committed to doing the restoration of the car, he was delighted to spend time with Halstead getting a lot of research information for the project. 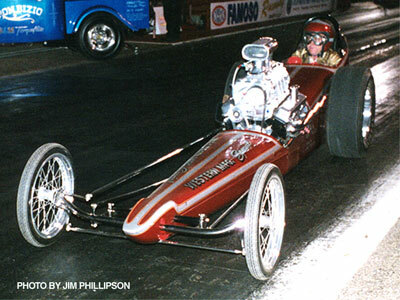 After the March Meet, Starrett stopped at Kent Fullers shop to pick up the car and start the long journey back to Snohomish, WA, with the car strapped to the roof of his wifes station wagon. 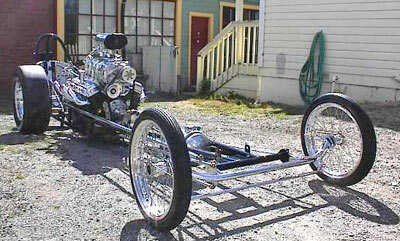 Understanding that Pete lives in a very small neighborhood where he is probably the only motor-head around, none of his neighbors had ever seen a car like this. 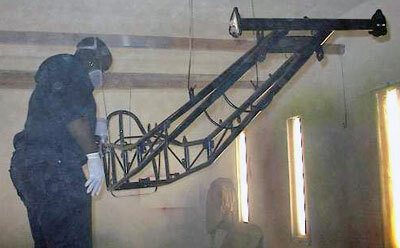 When it was still strapped to the roof rack, there was some amusing remarks about what it was. 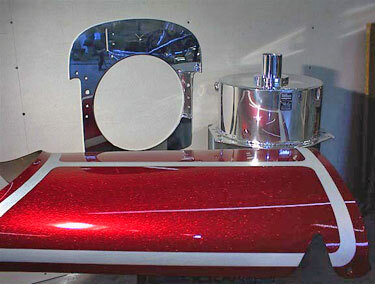 The next day, Starrett set out for Hayes Classics in Kirkland, WA to begin the process of restoring what is now commonly referred to as "The Little Fuller", aptly named by Fred Vosk. At first it was a little intimidating to have the little car sitting among such classics as the Bugatti and a one off Ferrari as well as the rare Cadillac is being restored for the 100th anniversary Cadillac celebration. 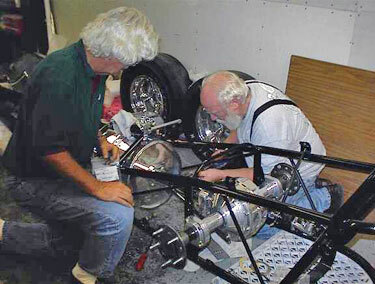 Over the next few weeks Vosk and Starrett struggled with finding the right parts and I spent lots of long nights and early mornings searching the Internet. The net result was debuted at the 2000 CHRR in front of The Doubletree on Thursday night. It spent the rest of the weekend parked at the Fuller display on Memory Lane. 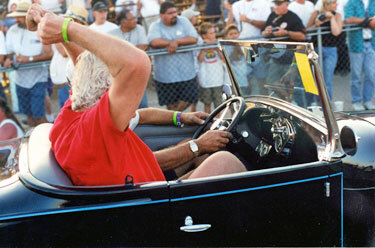 The car would return in 2001 in running condition and participated in Cacklefest II. 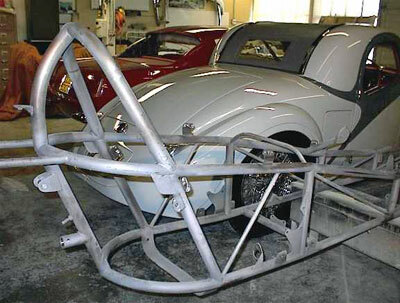 Eric Hayes sands the chassis in preparation for paint. 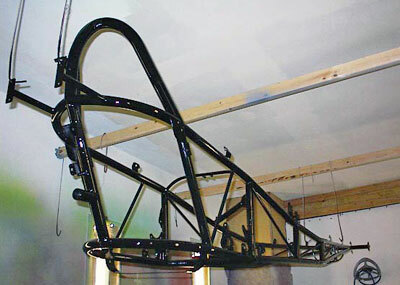 Hayes hung and painted the chassis. 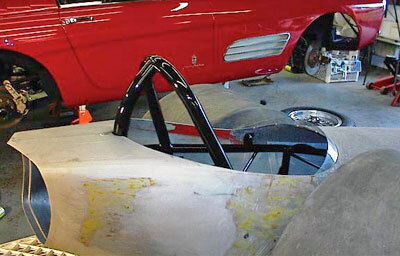 Starrett and Hayes fit the repaired body panels. 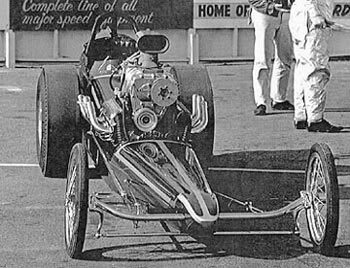 Not exactly what Fuller had in mind when he built the car... no front axle and late rear tires just don't have "the look". Aside from being a fine painter, Hayes is also an excellent polisher as this job on a 35 year old Halibrand wheel attests to. 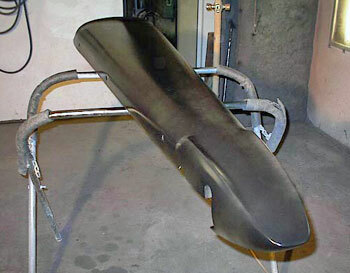 After taking any paint off the body pieces with chemical stripper, then sanding and cleaning the aluminum to the freak out point, as in you could eat off it, they get a coat of Zink-Chromate and then a couple of heavy coats of DP (epoxy primer). Nose in silver base coat. 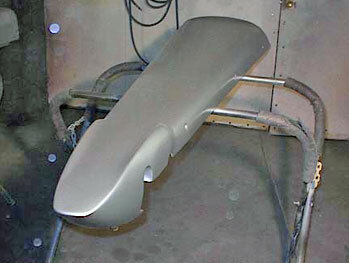 Fast forward to the paint finished and all parts polished. 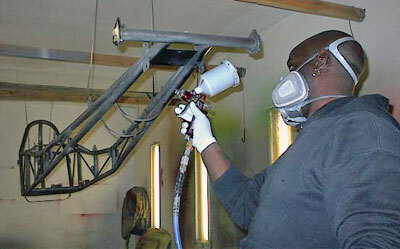 The paint process is urethane done the old way. When Starrett found the color he thought it should be they mixed a little toner with some real thin clear and sprayed it on a coat at a time until the color was right. Hayes did the spraying and hit it right on, a perfect transparent Candy Red. 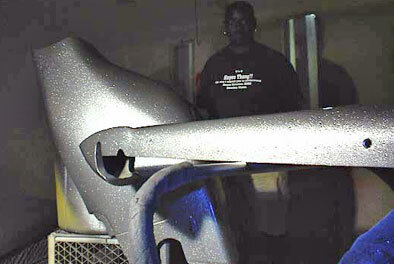 The red toner they used was Deltron DMD 669 and then used PPG DAU 82 clear, an Acrylic Urethane. The icing on the cake was the lettering done by Rick Evans. The man himself, Kent Fuller, came up to Washington to help with the final assembly. 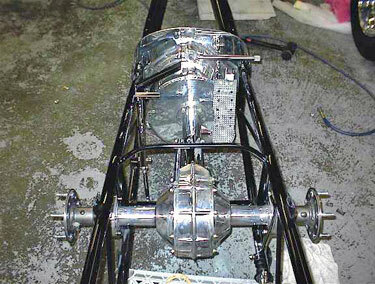 Rear end and drive line in place. 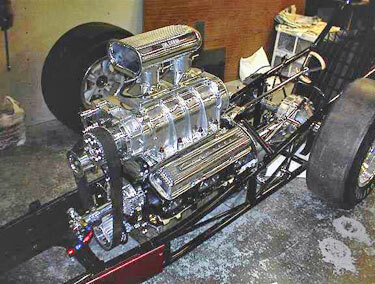 While all the glitz and glamor was being applied to the chassis, Starrett was assembling the blown fuel small block Chevy that is loaded with more of Hayes' polish work. 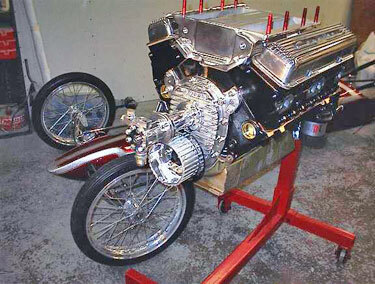 The finished product naked and dressed. A beautiful site outside the front door of the Double Tree Hotel on Thursday night was the "Western Manufacturing Special" AA/FD just restored by Pete Starrett. 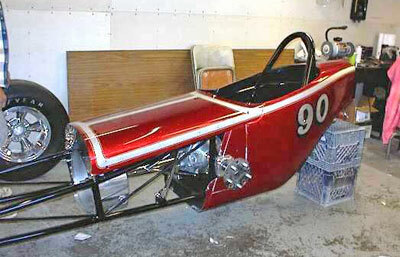 This 1965 Fuller car was owned by Jon Halstead and hung in the rafters of Jim Laing's shop for 30 years until Pete took it to Washington after the 2000 March Meet. 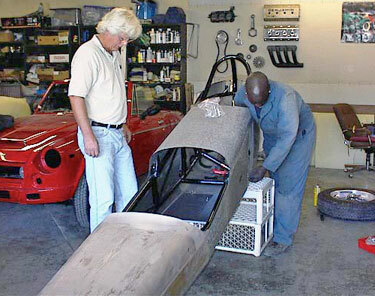 At that time it was a bare chassis, body panels and boxes of parts. 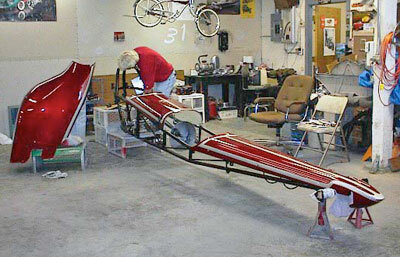 An all summer thrash by Pete, Eric Hayes, Fred Vosk, Kent Fuller and many others resulted in the prettiest restoration yet. The car must be seen to be appreciated. 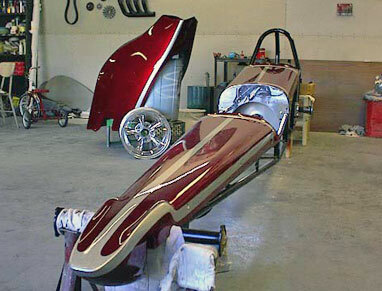 From the paint to the polishing it's magnificent. 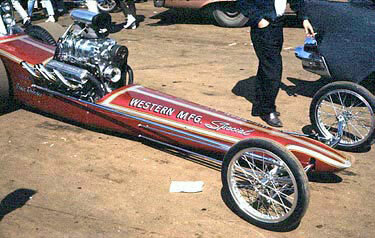 Pete Starrett spent 5 months restoring the Western Mfg. car and although it wasn't quite ready to run, he got it to the 2000 CHRR. 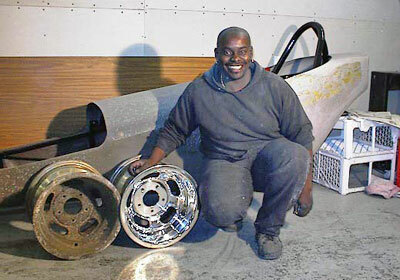 One of the guys who was instrumental in restoring the beautiful "Western Mfg. Spec." 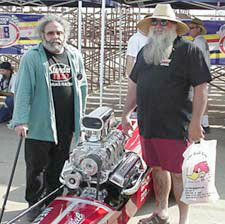 AA/FD was Fred Vosk (left). 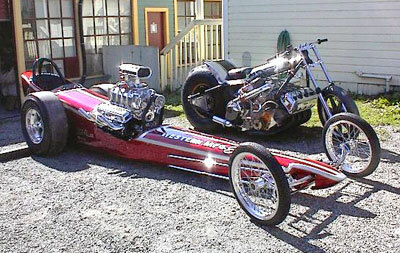 Fred's years of custom painting and race car experience really show here. 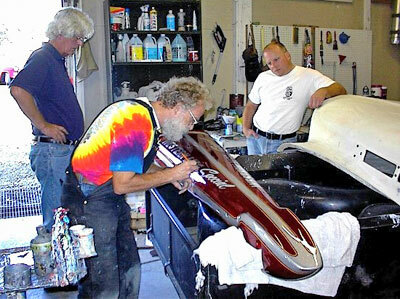 Although Eric Hayes did the actual painting, Fred was "holding his hand". 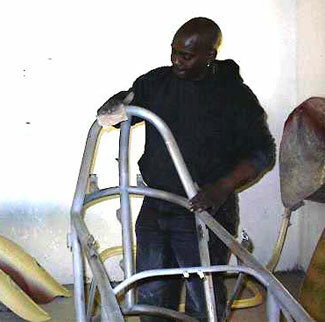 Magicar vet, Tom Morris (another great painter in his own right) joins in. 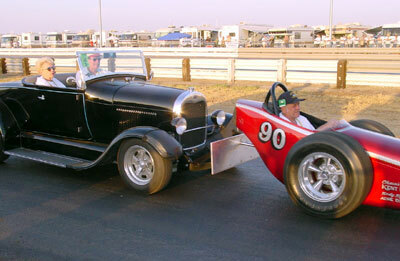 The car shared the track with three other restored and very famous Fuller cars for a photo shoot. 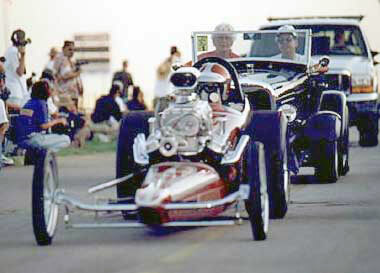 In the staging lanes prior to Cacklefest II in 2001. 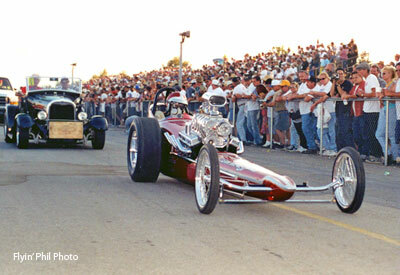 In 2000 the car debut as a static display - in 2001 Pete Starrett's perfectly restored "Western Mfg. Special" AA/GD was a runner. 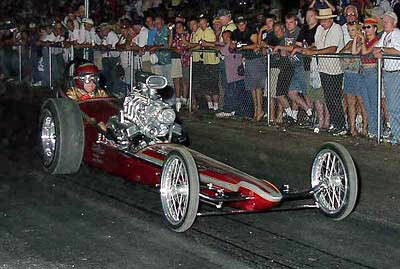 Fired for the first time just 4 hours before the Cacklefest, the candy red beauty performed flawlessly in front of the crowd. Co-owner, Jim Lange is in the cockpit for this memorial event. 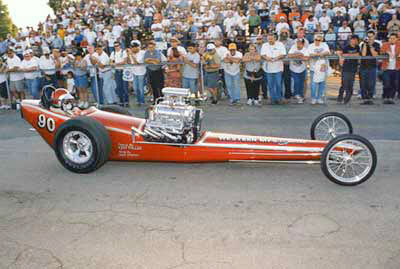 If anything thinks that Cacklefest isn't as emotional for the owners as it is for the fans, they're wrong as witnessed by Pete Starrett's excitement when his car fired for its first event. 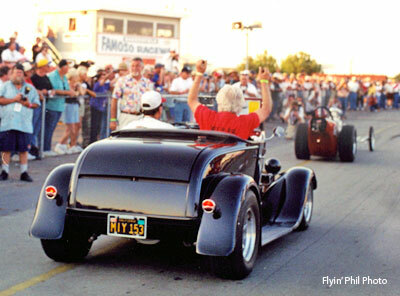 Jim Lange in the 2002 Cacklefest Parade. 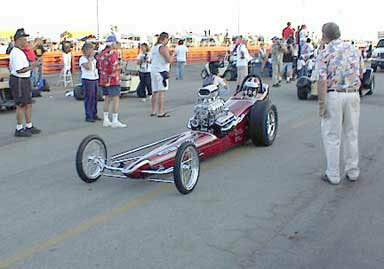 2002 CHRR Cacklefest push start. 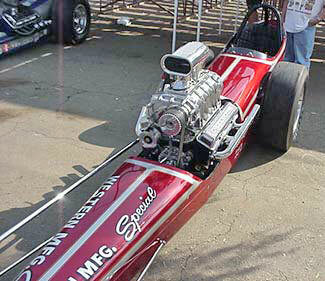 This candy red beauty performed flawlessly in front of the crowd. Co-owner, Lange is in the cockpit. 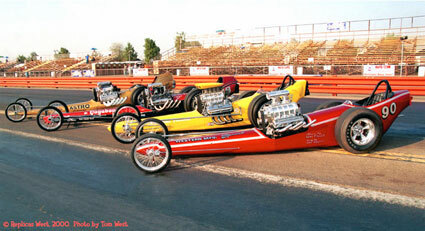 As it turned out, the 2002 CHRR was the cars last appearance. 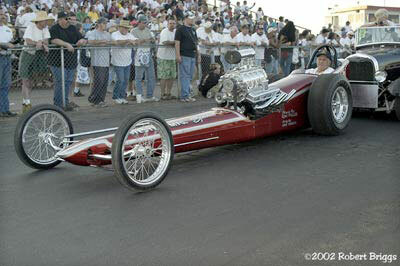 Starrett, unhappy with some "flaws" and minor damage took the car back down to a bare frame in 2003 and due to other situations has been unable to get the car back into Cackle shape. 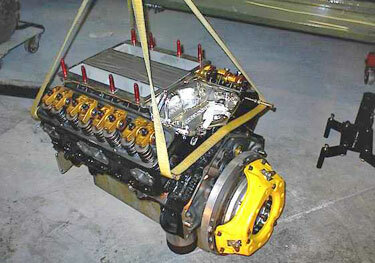 However, he is trying to get it ready for the 2006 event.